Hope you are doing great. It’s the last month of the year and its filled with Christmas and New Year fun and festivities. And in the beauty world too, it’s the time of the year when there are lot of sales and new launches going on. 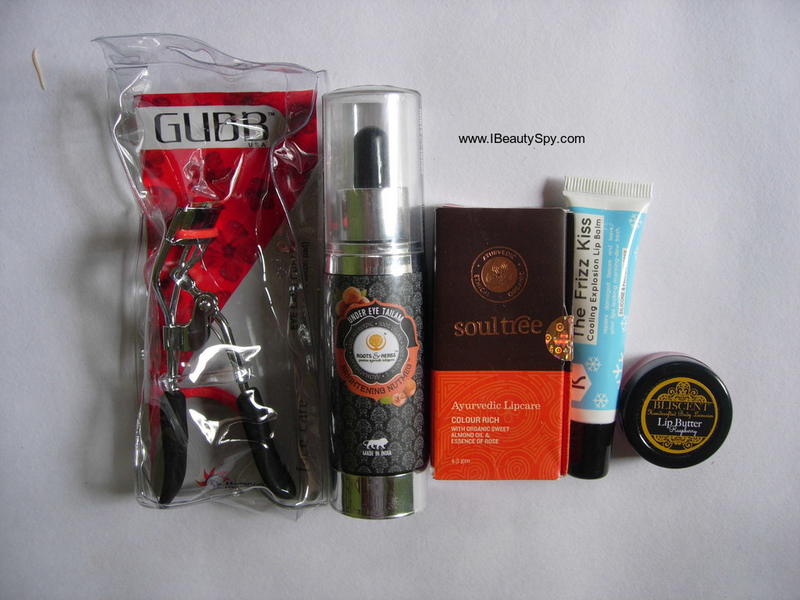 December beauty boxes are no way behind and most of them have festival and party themes. So today, instead of just doing an unboxing post, I will do a comparison review of three beauty boxes for this month – Fab Bag, My Envy Box and The Violet Box. So let’s move on to the reviews. Overall, I can say this month Fab Bag is just okay. Some of their previous bags have been really good and more value for money. I wish since it’s the party edition, they could have given a face mask or body polish instead of the foot cream. I ordered the December My Envy Box which is the Lashes and Pouts Edition. It comes in a pretty box designed with lips and lashes. There are 5 products and all are full size. Yay! I like this month’s box as all the products are natural and organic brands. Even the Soultree Lipstick is made from organic ghee, sweet almond and wild honey. It has no synthetic color, fragrance or preservatives. I am also looking forward to try the Bliscent Lip Butter and Root & Herbs Under Eye Thailam. I wish Envy Box maintains this quality and avoid sending tiny samples. The Violet Box has changed a little. Previously it used to be a period subscription box with few beauty products. You can check out my review here. Now they have two boxes where Violet Box is just indulgences and Period Box is sanitary essentials + indulgences. 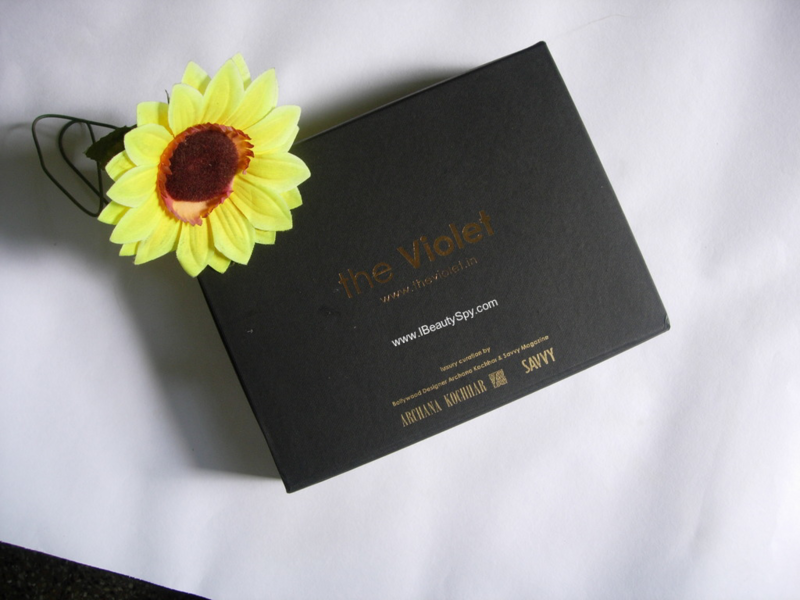 Celebrity curators design the Violet box each month. Bollywood Celebrity designer – Archana Kochhar, Savvy Magazine has crated the December Violet Box. I also like the social cause they are working for. For every box you subscribe, The Violet donates period essentials to those in need. Which I think is a really great thing! 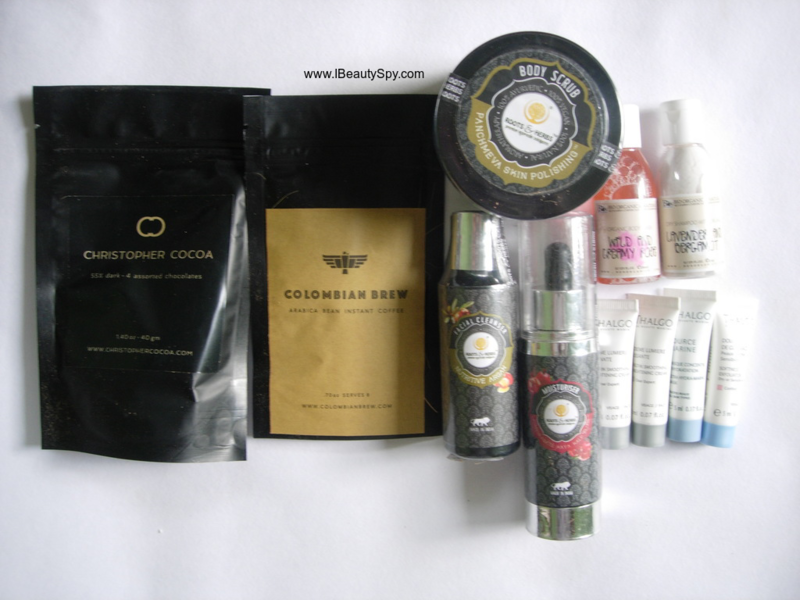 I totally loved December Violet Box and its really excellent value for money. Again all are natural, organic products out of which 3 are full size, 6 sample size products and also indulgences like chocolates and coffees. I am quite excited to try out the Roots & Herbs Pomegranate Moisturizer which contain pomegranate fruit extracts, rose petals, marigold and jasmine flowers. Sounds like an exotic treat for skin. Also looking forward to the body scrub which has anjeer powder 😀, almond powder, walnut, rose petals, pomegranate fruit extract and neem powder. I am also happy with the Thalgo samples, though I feel they are too tiny. I wish they stick with only deluxe samples and don’t send these 2ml, 5ml samples. Its hard to see how a product works with just 5ml which will last for a single use. Lastly, I love the fact that apart from beauty products, they have sent two of my favorites – dark chocolates and instant coffee which other beauty boxes don’t normally send. I must confess, I have great love and addiction for dark chocolates and coffee. My God! This seems to be a box curated especially for me as it has all my favorite products. Woohoo! So finally, its time for verdict! This month, Fab Bag has just been average. 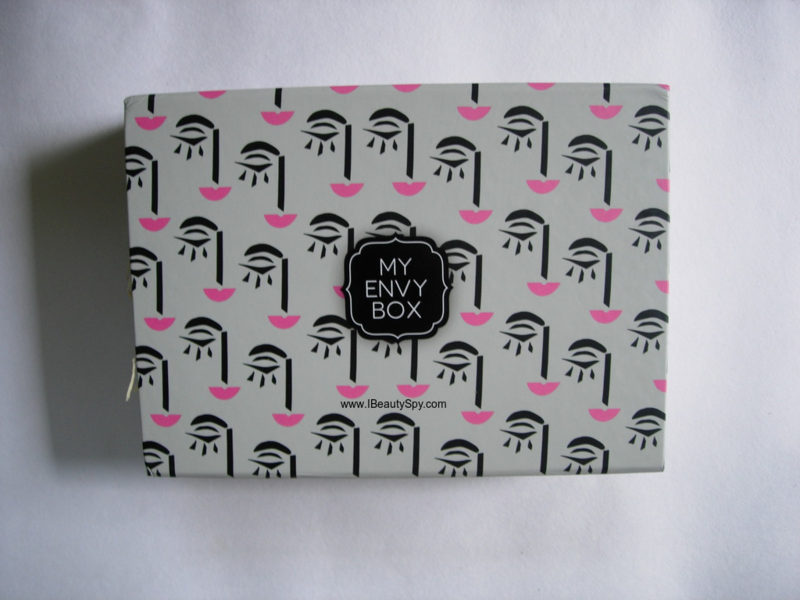 My Envy Box is really good with all full size, natural products. But The Violet Box has bagged the Best December Beauty Box award as you get products worth Rs.3600 and you pay only Rs.749, lesser than My Envy Box and more value than My Envy Box. I hope they continue to maintain the quality of future boxes as well. So that’s all folks! Which beauty box is your favorite? Which do you think is great value for money? You can read more reviews and unboxing of subscription boxes here. Fab Bag was good before. But nowadays its becoming more average. Violet Box has started off well. I hope they maintain the quality. Yes, Sonali, this month’s Violet Box is really good and value for money. Yes, I agree. Fab Bag is not good anymore. Before, it used to be awesome. I don’t know why they dropped the quality…. I ordered both the violet box an envy box. For violet box i paid rs.749 and for envy box i paid rs.680(20% discount). From violet box i received products worth rs.3600 and from envy box i received products worth rs.2284 + a omorfee lip balm worth rs.799 as a free gift which i am totally in love with. For me the star product of violet box is the roots and herbs pomegranate moisturiser and the star product of envy box is the under eye tailam,soultree lipstick, and the omarfee lip balm which is a surprise gift and i did get surprised. Overall i loved both the boxes..i am over satisfied with both the boxes and will surely buy the january boxes. January violet box seems intetesting but the envy box did not really attract me this time…january fabbag products are good this time..for those who does not have the sugar lipstick they can simply grab this month’s fabbag.